* Professional-grade, feet-inch-fraction and metric dimensional calculator that delivers 60 of the most needed Imperial-Metric (SI) conversions resulting in over 400 conversion combinations. 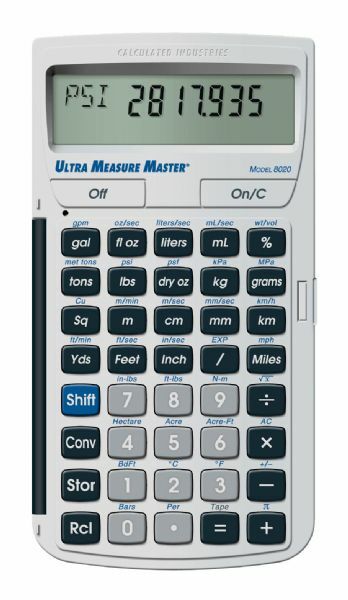 * Converts to and from linear, area, volume, weight, weight-to-volume, linear velocity, flow rate, pressure, and much more. * For engineers, contractors, purchasing agents, technicians, inspectors, or anyone needing a broad range of conversions. * Includes 360° protective hard cover, easy-to-follow pocket reference guide, long-life battery, and full one-year warranty. 7" x 5" x 0.75"